"Just made it up 5 minutes ago and it's really good. It can be served warm or cold; toss again right before serving. Do not overcook the noodles." Fill a bowl with boiling water; add rice noodles. Cover bowl and let sit until noodles are softened, about 10 minutes. Drain. Add 1 tablespoon olive oil and toss to coat. Mix romaine lettuce, red bell pepper, red onion, green onions, cucumber, basil, cilantro, ginger root, jalapeno pepper, and garlic with rice noodles. Whisk 1/3 cup olive oil, rice vinegar, soy sauce, white sugar, lemon juice, lime juice, salt, turmeric, and paprika together in a bowl; pour over rice noodle mixture and toss to coat. 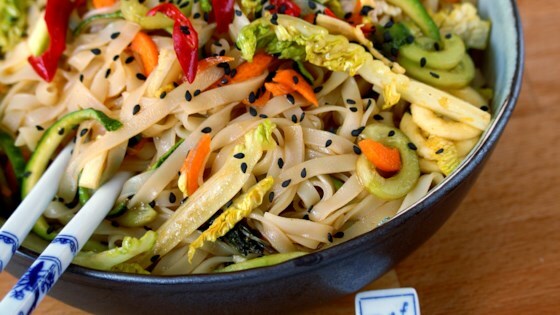 See how to make a simple, spicy and delicious rice noodle salad. Delicious with dinner, but i thought it was even better the next day after soaking up some of the flavors. I didn't make the sauce by exact quantity. I adjusted the amount of sugar, soy sauce, oil, etc... to taste. Also cabbage taste better than the lettuce in this salad. Sauce was tasty but way to much. I shouldn't have added the whole thing. This is delicious and super quick to make. We ate it cold and LOVED IT!